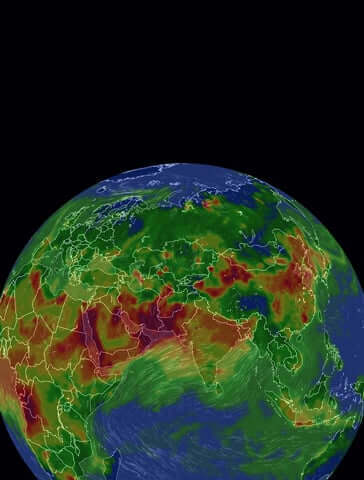 In less than a year, IQAir's AirVisual Pro has been deployed as an outdoor air monitoring station in more than 20 countries, for some of which Pros are the only data source. Citizens have chosen to take their local air quality into their own hands around the globe - discover where and why! When visiting a Unioil gas station in the Philippines, you may notice a transparent box hanging over the shop entrance door. Inside, an AirVisual Pro is resting, measuring ambient air quality and broadcasting the results to IQAir AirVisual’s public air pollution database. 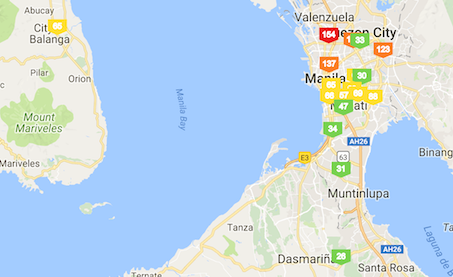 The live air quality readings serve as a constant reminder of the impact of our consumer choices, when we fuel or ride in a car, bus or jeepney. Internationally known for its paradise-like islands, the Philippines and capital Manila in particular, have also made headlines for their overcrowded roads, rated the worst in the world. Limited public transportation infrastructure has led many of the 103 million people living in the archipelago country to commute via their own vehicles, resulting in saturated highways, traffic jams and polluted air. Growing media coverage of the situation in recent years has revealed a lack of data from the resulting emissions, leaving many Filipinos unaware of the nature and scale of the problem. In 2016, Unioil sought to measure this impact by creating a network of AirVisual Pros, now stretching across 18 locations in key cities, and continually growing. The strategic placement of the air monitors at fuelling stations puts them at the crossroads of many dimensions of the issue. Unioil hopes the visibility of the AirVisual Pros in these public locations will encourage Filipinos to notice the pollution level in the areas they work and live, and raise awareness of air quality across these areas. Metropolitan Manila, home to 22 million residents, is one of the most decentralized urban areas in the world with a population density seven times higher than New York. It may come as little surprise then that Metro Manila is saturated with vehicles, some of which are high emitters, like the iconic “jeepney”. 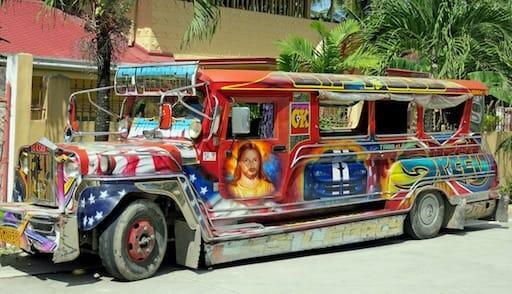 The “jeepney”, for those unfamiliar with the term, are unmissable, decorative commuter buses, now symbols of Filipino culture. Originally U.S. military vehicles used during the Second World War, today, their outdated motors and heavy metal framework result in very poor energy efficiency. Thus, while providing the cheapest form of transportation in the Philippines, these colourful vehicles do so at a cost of 22,000 metric tons of soot a year. The Filipino government first began legislating for cleaner air in 1999 with the Philippines Clean Air Act, yet jeepneys and traffic congestion remain real challenges today. In response, Unioil Petroleum Philippines Inc. has sought to propose realistic measures to help Filipinos reduce their vehicle emissions. The company is a pioneer in the Philippines in terms of introducing more environment-friendly fuels. Last 2013, Unioil brought the introduction of Euro 4 standard fuels to the Philippines, when the required industry standards were still at Euro 2. In September 2017, Unioil started distributing Euro 5 standard fuels across its retail stations when the industry requirement was still at Euro 4. With a maximum sulfur content of 10 parts per million, Unioil's Euro 5 fuels is 5x cleaner than other conventional fuels sold in the country. Unioil believes that enabling Filipinos to access an affordable and more eco-friendly fuel is a step towards slowing down climate change and promoting cleaner air, a mission firmly endorsed by the company. 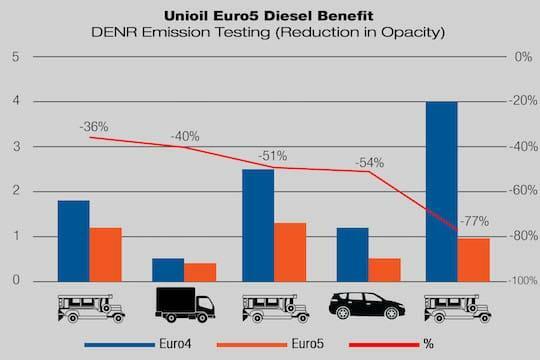 Based on actual field tests conducted by Unioil with the Department of Environment and Natural Resources, Unioil's Euro 5 fuels can provide various types of vehicles up to 77% cleaner emissions compared to Euro 4 standard fuels. 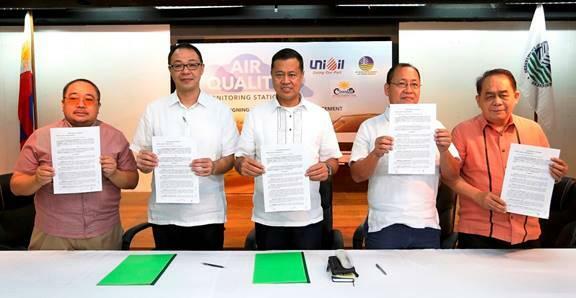 In line with this mission of safeguarding the natural environment for future generations, Unioil has partnered with the Philippines Department Of Environment & Natural Resources (DENR) and signed a Memorandum Of Agreement supporting the commitment to an AirVisual monitoring network. By partnering with the government, they seek to promote more environmentally-friendly policy decisions and responsible choices, from within one industry of concern. Together, the goal is to prepare a national air quality status report which will form the basis of making an air quality improvement framework. Unioil's strong commitment to promoting clean energies and awareness offers inspiration of how companies and conscious consumer decisions can align to change a city's landscape, and promote a cleaner, healthier future. We eagerly wait to see how this national data will affect attitudes and policies towards air pollution within the Philippines. Clean Air Philippines Movement, Inc. awarded Unioil as the first corporate Clean Air Champion due to the initiatives that Unioil has taken for the environment (Left). IQAir joins Unioil representatives holding the Clean Air Champion award (Right).